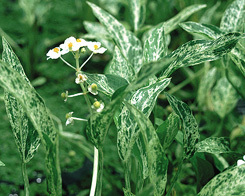 Variegated Arrowhead (Sagittaria graminea (Crushed Ice) Enjoy foliage with creamy yellow and green mottling. Very striking. Has spikes of white flower clusters with yellow centers. This pond plant will grow 12″ – 24″ high and spreads to 12″.